I love using social media, especially Facebook and Pinterest. However, if I’m not careful, I can spend way too much time on these sites. I noticed the problem when I first became a stay-at-home mom after my two youngest children were born. At first it wasn’t a problem; I just checked social media when the kids were napping. Then, as they got older and napped less, I found myself checking quickly throughout the day. It wasn’t long before I realized that I was spending too much time on Facebook. I set up a schedule to only check social media when I first wake up in the morning (while my husband is feeding the kids breakfast), in the afternoon when the kids are watching their favorite television show and aren’t wanting to interact with me anyway, and at night after the kids are in bed. My husband has suggested getting a smart phone, but besides the financial burden that comes with that, I also don’t want to have more options of checking e-mail and social media on the go. I want to limit that to the schedule I set up. Part of the reason why I love Facebook is because I can keep up with family and friends who live far away from me. I can also get links to great homeschooling ideas and timely topics that give me things to write about. I also need to use Facebook, Twitter, and Pinterest to publicize my own blog and the articles I write for other people. I can’t simply do away with social media, nor do I want to. The difficulty is reigning in social media’s seductive hold. I’m not alone with this struggle. “It likely isn’t Facebook itself. . .it is all of the self-promoting features that it offers: posting what you are thinking, posting pictures of yourself, giving your opinion on what others post via ‘likes,’ etc. And throw in a little intermittent reinforcement (e.g., not knowing when the next time someone will like or comment on your post–indeed the same reinforcement schedule that casinos use), and Facebook has a winning formula” (The Huffington Post). I get that social media is a great way for us to connect with others. 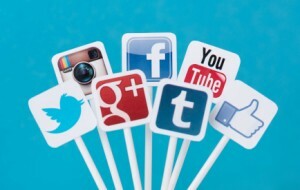 Social media can be a useful tool and a positive addition to our lives. The trouble comes when we escape to social media too often at the expense of those who are physically present with us. I can’t count the number of times I’ve seen a mom or a babysitter at a park who becomes so engrossed with what’s on her smartphone, she doesn’t even acknowledge the kids she has brought to the park. Or what about the people who go to a restaurant together and simple sit across from one another checking their phones and never interacting? “Consider the results of a March study by researchers from Boston Medical Center who carefully observed caregivers and children at fast-food restaurants. Out of 55 caregivers, 40 used their mobile devices, and their absorption was such that their ‘primary engagement was with the device, rather than the child.’ In many cases, the caregivers expressed irritation when the children tried to get their attention” (SBS). With caregivers so distracted and unable to give children the attention and interaction that they need, many kids turn to misbehavior to get their parents’ attention. “Most people just don’t realize how much time they’re spending online; what feels like a few minutes is often a half hour or more. When we are with our children, we need to be with our children–not with them except for the part of us that’s reading emails, tweeting, and checking Facebook” (SBS). Have you struggled with spending too much time on social media? If so, what did you do to break social media’s stronghold on your life? i have a smartphone and deleted my Facebook app when it became to time sucking. You can still access it through your browser, but I never went through the trouble. As a blogger, you kinda have to have access to social media, but I’m watching which sites are driving traffic to mine and eventually, I’ll stop doing much with the other accounts. I think having Facebook or Twitter apps on your smartphone is a big way to become addicted. That’s why I don’t have these apps.